Hi everyone, I’m back with another Easter craft for you. 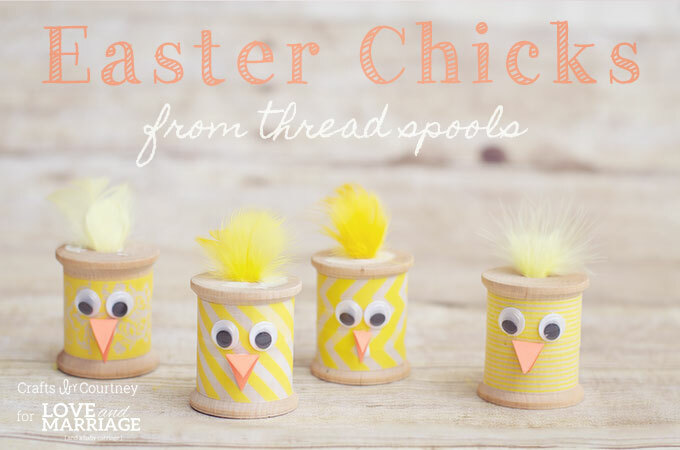 Last time I made Thread Spool Bunnies so this time I thought why not make Thread Spool Easter Chicks to match!! 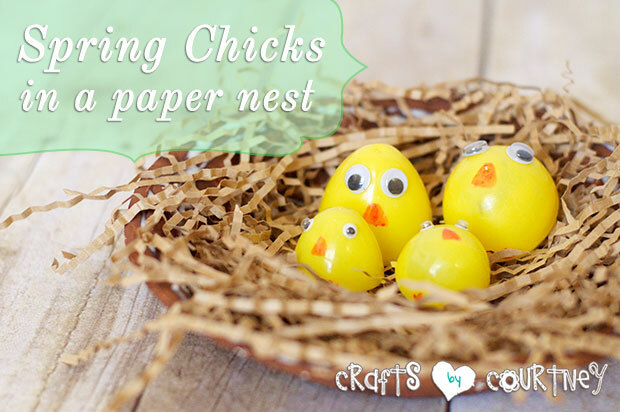 I just LOVE an Easter Chick Craft, and they are so adorable! I had a fun time with my boys experimenting on how we were going to make them. At the end I think we were all happy. How could you not be happy looking at these little chicks?!? I pulled out my “handy dandy” wooden thread spools. I got lucky and scored a big bag for $5.00 (total bargain). We also needed some yellow washi tape and feathers. I don’t think I’ve done any crafts using feathers so we were pretty excited. My boys just loved playing with them. We gathered up the rest of our materials and got started!! 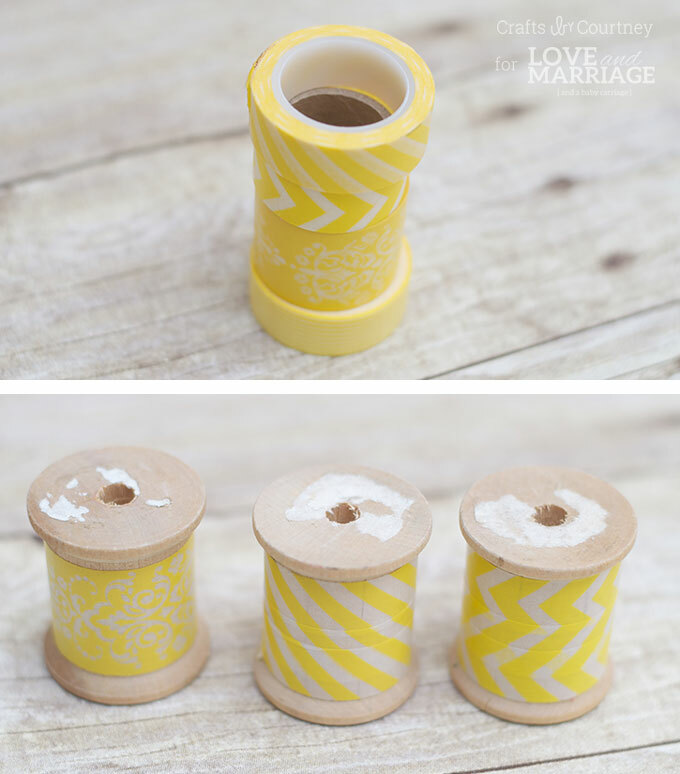 Wrap your thread spools in washi tape. I’m such a fan of washi tape. It’s just so easy to use, especially for kids. 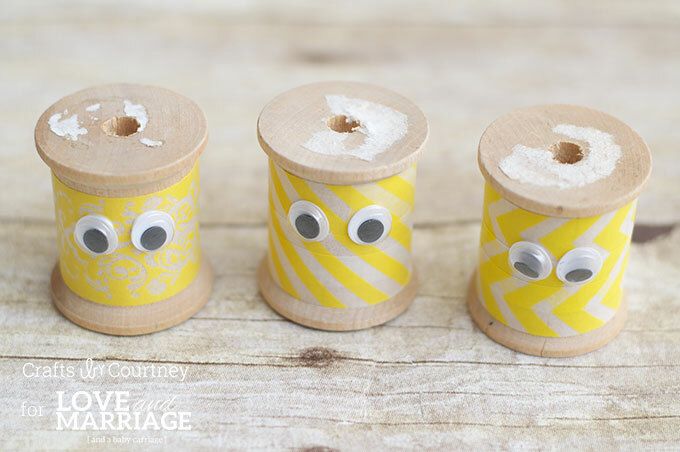 We glued on our little googly eyes. I totally wish we had the adhesive ones on hand, those are the best for kid crafts. But these glued on pretty easy. Next we added the little beak. I used a scrap piece of orange paper. I folded the paper over and cut out a triangle shape. This will make sure the beak (diamond shape) is the same size. Add on with a little dab of glue and place on thread spool! 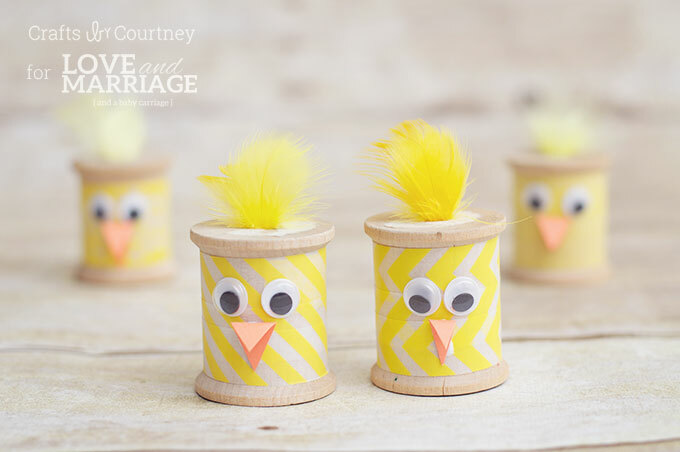 Finish off these little chicks with a yellow feather on top! Voila, all done! You don’t even have to glue the feather, just place it in the hole on top of the thread spool. I think it took us a total of 5 minutes to make our little chicks. 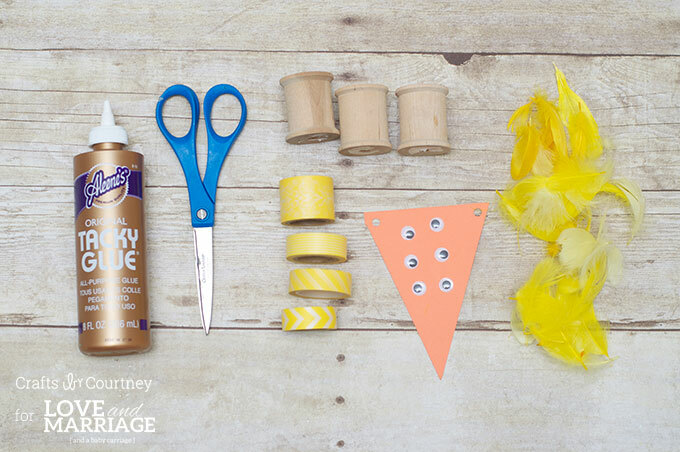 This is a great craft for an Easter party or even for a class of little ones. 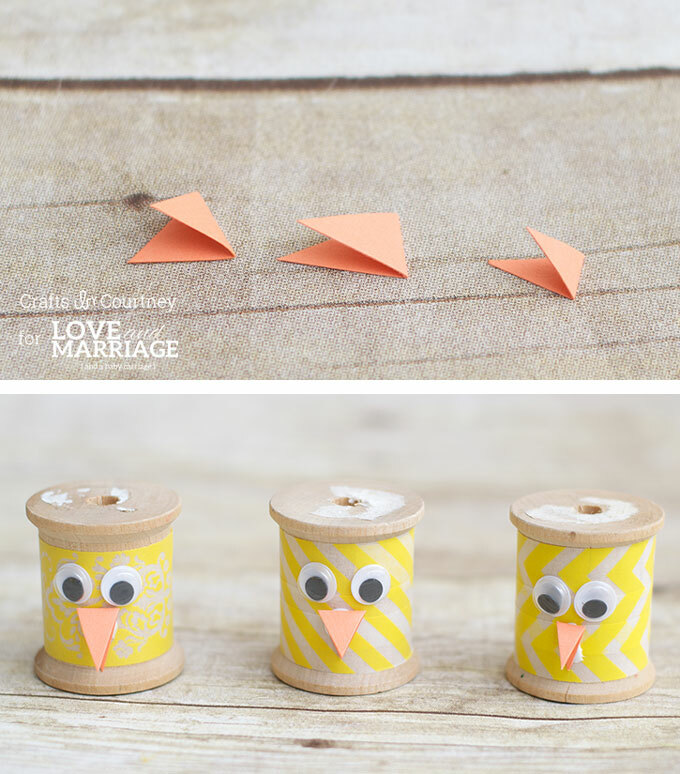 Here are a couple more Easter crafts you might enjoy with the kids! We made these Spring Chicks with some Plastic Easter Eggs! We love saving our old broken crayons. So last year we decided to make some Easter Egg Crayons. They turned out great! We had a blast working on our latest Easter craft. 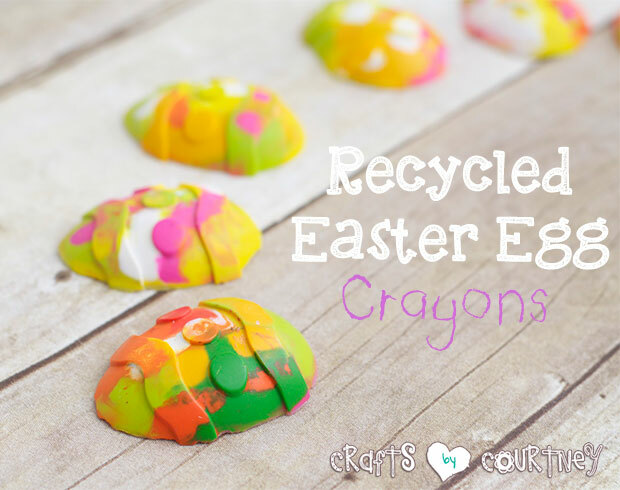 I hope you could find some great Easter inspiration, and make sure to check out all of Liz’s fun Easter crafts and ideas as well!